Snow Rider | Helmet or Heels: I'm comfortable in either! Just reminding myself the snow is coming soon! Living in Minnesota it is only a matter of time before the snow flies. 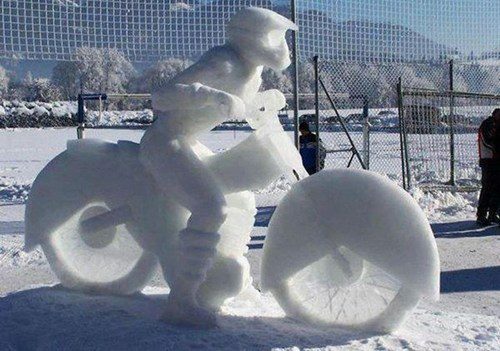 Some creative person created this Snow Rider and is a good reminder the snow will come, but it is followed by Spring! This entry was posted in Riding and tagged change, motorcycle, weather, winter. Bookmark the permalink. Very cool! Or is that cold, brrr. People’s creativity always amazes me. I think it is because I am not that creative. Note to self….. “don’t stand still too long in Minnesota winter, end result not good!” This is awesome stuff. Excellent sculpture – why haven’t I seen that one before!